This is just a short post to introduce our two new (temporary) family members. We are fostering two adorable little dogs. 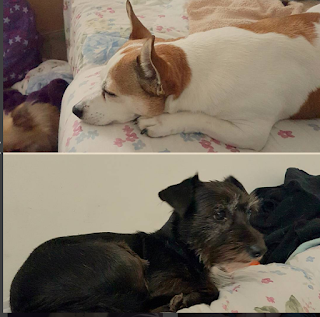 A Chihuahua/Jack Russel mix named Vida and a Yorkie/Jack Russel mix named Penny. They lost their home in a fire and were sleeping rough with their human mum. Their mum was able to find a friend to stay with but they couldn't have the dogs there so she needed to find somewhere for her babies to go. They came to us to be loved and spoilt while their mum gets back on her feet and finds somewhere for them all to go. They have fitted into our pack very quickly and they are lovely! We love having them here with us. If you have the time and space, I would highly recommend fostering for your local rescue - It is extremely rewarding and can make the world of difference to these sweet dogs!